MAKING A POT OF HOMEMADE ASPARAGUS SOUP DOESN’T GET ANY EASIER. Although we enjoy broth and tomato based soups another famous soup we make in the CBB kitchen is our Cream of Asparagus Soup. Not only is it low-carb and gluten-free it’s extremely easy to make, budget-friendly and brings home the flavours of Ontario produce when available. During early-mid June if you love to forage you can find wild organic asparagus growing in ditches around farmers fields preferably that grow and sell asparagus. Mrs. CBB grew up with her dad who loves to forage still to this day. Over the years since she was a small child she’s foraged for wild asparagus, wild mushrooms, wild berries and plenty of other free wild edibles. I’ve been introduced to the foraging life quite a few times and it’s amazing what grows and is hidden in the forests, ditches and tall grasses. I won’t get into the specifics of wild asparagus picking but Mrs. CBB found Crystal over at Whole Fed Homestead who offers a detailed blog post about How To Hunt and Forage for Asparagus. Mrs. CBB says that reading her post brings back lots of memories because this was exactly how her family would forage for asparagus. One of the nice things about making homemade soup is that if you make a big pot you have easy lunches and dinners for a few days. In our house we make a big pot of homemade soup about once a week sometimes twice and we love it. Although it’s the wrong time of year to forage for asparagus you can start to find sale prices for asparagus in your local produce department. Depending on when harvested you’ll find the price can be as low as $1.99lb to $4.99lb. You can also buy asparagus in bulk, blanch it and then freeze for later use. You can also can/jar asparagus for use throughout the year. Another popular way to enjoy asparagus is with eggs or pickling them to eat like pickles or as a garnish. In Wisconsin Crystal will find wild asparagus in the Fall where in Ontario we can find it during the months of June and July and into the Fall. Like she points out asparagus loves sunshine and in Ontario that brings us into the Spring, Summer and Fall months. I didn’t make a large pot of this asparagus soup as we also made a pot of cream of radish soup at the time so we kept the portion sizes smaller. This pot of soup will be enough to feed 4-6 people. Obviously this soup is low carb as the Mrs. wouldn’t have it any other way, besides you can’t even tell because the only difference is the thickening agent. Instead of using a flour or starch to thicken the asparagus soup we use a bit of xanthan-gum a food thickening agent or stabilizer which you can find at any health or bulk food store. If you don’t want to use xanthan-gum because you’re not a low-carb foodie simply add a tablespoon of flour or cornstarch with equal amounts water to a small bowl, mix and add to your soup and blend. Use the same method as you would to make a gravy. Start off by washing the asparagus then chopping it up into pieces then adding them to a pot with 2 cups of chicken broth by using cubes or a bone broth. I lightly boil the asparagus until tender which takes about 5-7 minutes then add butter. Use the stick-blender to mush up the asparagus and then put back on the stove-top on low heat. If you prefer a chunky soup then keep some of the asparagus in chunks. Finally, add your spices, lemon juice and stir. Finally add the cream and xanthan-gum and a further 4 cups of chicken broth and blend. Let the cream of asparagus soup cook on low for about 10-15 minutes to thicken and warm through and it’s done. Cream of Asparagus soup with Asiago cheese is the perfect start to a lunch or dinner menu paired with a sandwich or as an appetizer. In a medium to large pot add 2 cups of broth and the chopped asparagus. Boil until tender, remove from heat, add butter then use a stick blender to blend. If you want to leave the soup chunky don't blend completely. Put back on low heat for about 15 minutes to thicken and blend the flavours. Adjust flavours as needed or desired. Top with asparagus tops, sour cream, Asiago cheese or your favourite toppings. 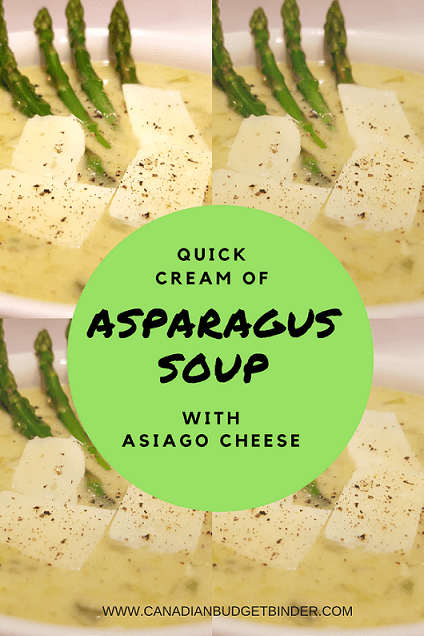 You can top your cream of asparagus soup with Asiago cheese which has a tart strong taste which is perfect the perfect pairing. Sometimes we like to add a dollop of full-fat sour-cream. 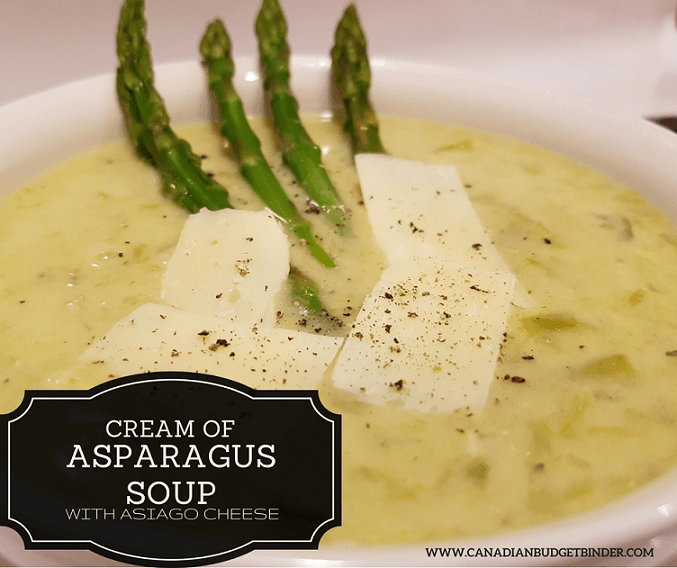 If you’re on a low carb high fat diet this cream of asparagus soup is a wonderful meal in a bowl. Alternatively for those of you who just love cream soup this asparagus soup will certainly warm your soul. Discussion Question: What would you top your asparagus soup with?